No one likes to have a roof covered in mold or moss. Not only is it unsightly and have the potential to drive your property value down, but it can also be seriously damaging to the structure of your home if left untreated for a long time. There are health risks that could affect you and your family, too, if it’s not taken care of quickly. If you are noticing dark green or black spots on your shingles, it’s likely caused by algae growth. Algae spores like to grow on wood and asphalt shingles in places that don’t get a lot of sunlight. If left untreated, the algae growth can eventually lead to completely rotted shingles – an expensive repair, especially if these rotted sections allow water to get inside your home. If there are fuzzy or filmy black, brown or green spots on your roof, you could have mold growth. Mold likes to live in humid environments. Since it thrives on wood and drywall, if your roof has mold growth, it could quickly move into your home and become a greater problem inside. Moss is recognizable by its green coloring and unique plant structure. 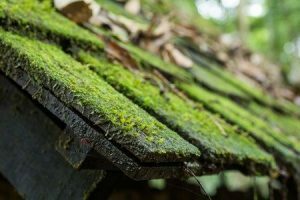 Moss is attracted to moisture, like mold and algae, but moss can actually start to retain more and more moisture as it grows, which will quickly lead to compromised areas on your roof and further water damage. Mold infestations on your roof or inside your home can also cause serious health problems, notes Angie’s List. People who are prone to respiratory issues, like someone who has asthma, will at increased risk of complications such as congestion and inflammation, symptoms that mimic the feeling of a common cold. The only way to improve someone’s health is to remove the mold. There are some steps you can take to prevent algae, mold or moss from damaging your roof. First, keep your gutters clean so that after it rains, all moisture can be properly drained from your roof. You should also make sure your roof is properly ventilated, says This Old House, and trim back any trees or plants that are touching your roof. If you are already dealing with growth on your roof, there are a few steps you can take to clean up the mess. Try washing your roof with a bleach and water mixture (one part bleach to one part water). Make sure to pre-rinse any plants that are in the splash zone with water, and then rinse them clean afterwards with water. Bleach will get rid of algae and mold, but may not prevent it from growing back. Use copper flashing underneath the shingles closest to your roof’s peak can help stave off mold, moss and algae build up, and replacing any damaged shingles immediately will help remove any spores that may be embedded in the roof. For serious infestations, you might need to get in touch with the experts at Roofing by Bruce. We’ll be able to replace any damaged areas, and treat your roof to prevent future growth. To learn more, give us a call today at 570-424-7250.